This modern D-55E remains true to all the premium appointments of its 1968 predecessor, including a AAA Sitka spruce top, solid Indian rosewood back and sides, ebony fingerboard and bridge, and nitrocellulose finish. 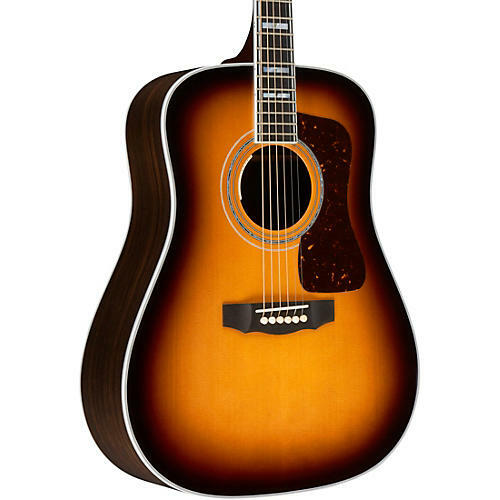 Internal refinements include scalloped Adirondack bracing, as well as an improved dovetail neck joint, hand-fit to make this generation of D-55, the lightest, loudest, and best-sounding yet. The D-55E showcases Guild’s most recognizable headstock, fully bound and featuring the Guild “Peak and Shield” inlay combination over a figured ebony overlay. The matching ebony fingerboard is also fully bound and inlayed with Guild’s iconic abalone/pearl “V-Blocks” and multi-line “railroad track” purfling on the bass and treble sides. The D-55E’s fingerboard is set on an all-mahogany neck with beautiful walnut center seam running the length of the heel to headstock. The D-55’s nitro Antique Burst finish is hand-sprayed for minimum thickness and maximum resonance that will only get better with age. It also comes with an L.R. Baggs pickup system to give you more playing versatility. Each guitar includes a hand-signed certificate of authenticity and ships with Guild’s Premium humidified hardshell case.